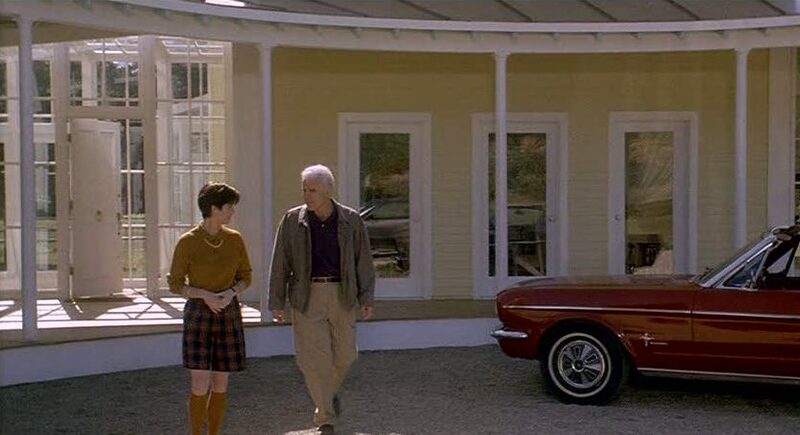 Steve Martin's Yellow House in the Movie "Housesitter"
The 1992 comedy Housesitter with Steve Martin and Goldie Hawn is one of my favorites. Not only does it still make me laugh when I watch it again after all these years, but I’ve always loved the little yellow house in it. Let’s take a closer look at how they built it as a temporary standing set for the movie. 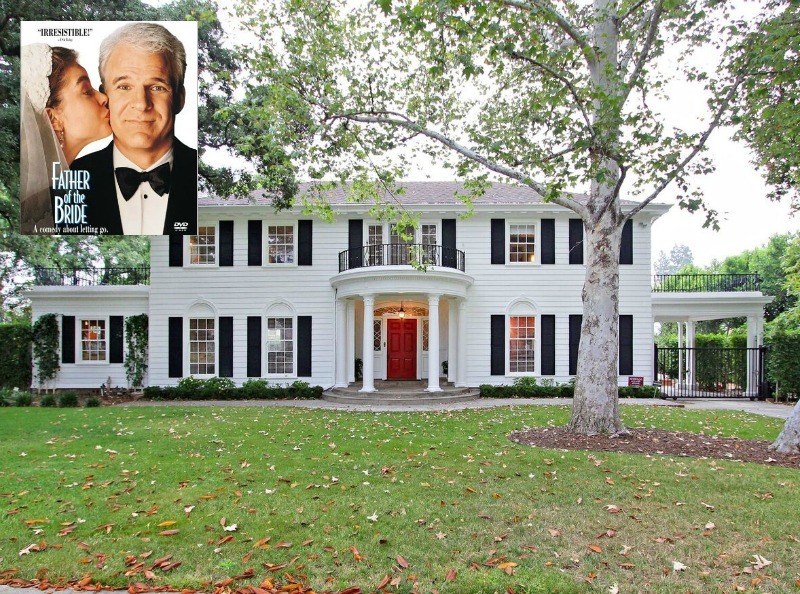 Dana Delany, who plays architect Steve Martin’s hard-to-please squeeze in Housesitter, must be the only person in America not impressed with his dream house. ”It taps a memory bank,” says architect Debra Wassman, who did the design with husband Jonathan Lanman. And [the house plan] is available by mail from New York’s Trumbull Architects. Finding the front door of Davis’s house empty and unlocked, she lets herself in and looks around. The house was built as a “standing set” in Concord, Massachusetts, and torn down after filming ended. This black iron bed was so popular in the ’90s. Seems like it was everywhere! Note the gold taps. Brass went out of style after this and now it’s back again! It’s a small house with one bedroom and bath and an open loft. The small town of “Dobbs Mill” was actually Cohasset, Massachusetts. Designer Kelly Wearstler is listed in the credits (she helped with the sets). Meg Ryan was originally cast in the role of Gwen. In one scene, Goldie Hawn is singing “The Name Game,” and she inserts the names Katie and Ollie into the song. Her children are Kate Hudson and Oliver Hudson, who were little at the time. 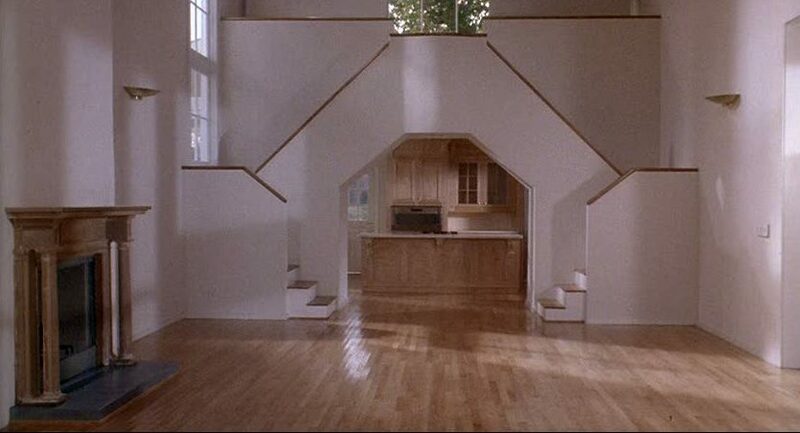 I talked to Debra Wassman, the architect behind the Housesitter house, who says there were actually two houses. The main difference between the movie house and ours is the center feature of our house was the two-story fireplace not an opening to the kitchen, and we also had a garage. The film house was a set and torn down; our house was bought and badly renovated so really both are lost. The original plans were built all over the country, and the world; we have seen a few. I know the changes on the movie house were made for filmability, but also so they didn’t have to pay us a fee! We got film credit because we asked, not because they offered. 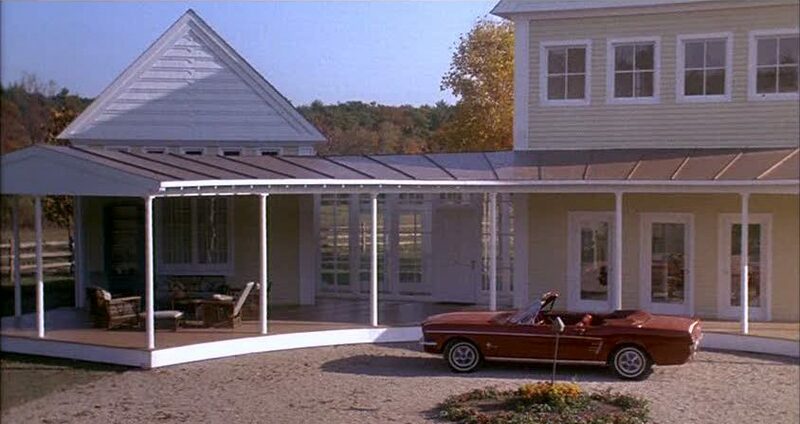 The Houses from "Ferris Bueller's Day Off"
I have to admit I am a Steve Martin AND Goldie Hawn fan. Not only was this such a fun movie, but you are so right… a glorius house movie! omg! I love, love, LOVE this movie! And I absolutely love the house in the movie. 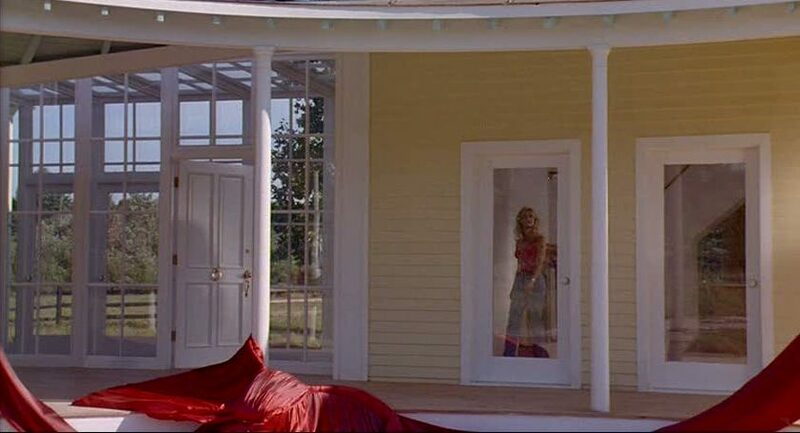 Where Goldie Hawn is just sitting outside the house cross legged, studying the house, and there’s the huge red ribbon sagging around the house is a perfect scene because as it is later explained, she appreciates this house, the reason for the existance of this house, whereas Steve Martin’s girlfriend does not. But the design of the house is sublime! It’s not huge, but it’s absolutely beautiful and it just flows and Goldie fills it with second hand furniture and her own personality. The movie itself is wonderful, how they fall in love through lying to each other and relatives and work people which creates a real world for them. Love it! And i have to say, I lvoe Goldie’s “parents”. Such a funny movie. Must see. Have to watch it again this weekend. This was a great post, Julia! I’ve only seen a few snippets of the movie, but it actually looks really cute. The house is lovely, and I know I’d enjoy sitting out on that front porch. The shot of the village makes me want to go and visit Massachusetts. 🙂 You do such a good job of getting great shots from a movie!! I was right! I just didn’t remember the name, lol! Love that house…perfect size too. I remember loving this house when the movie came out!!! great seeing all the details!! Beautiful House. Thank goodness high waisted jeans went out of style. Yikes!! Funny how the house could withstand the test of time but the clothes sure couldn’t. 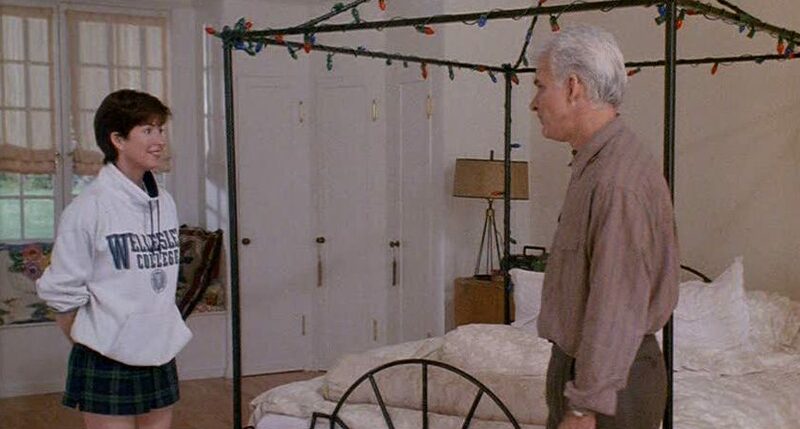 Funny – Steve Martin is playing an architect in the new Nancy Meyers movie. He has that intellectual quality about him. This is a lovely little house – although the interiors certainly didn’t stand up to the test of time! 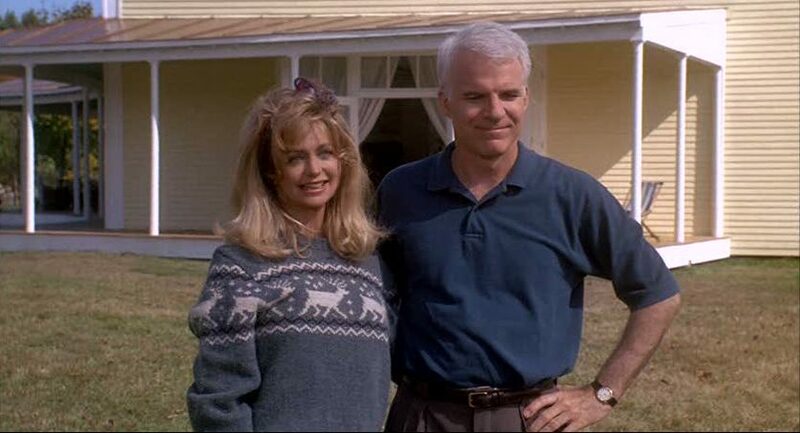 Aw, I love Steve Martin and Goldie Hawn! Looks like an adorable movie. I like the house except the stair area – blech. Oh Julia, I so want to rent this movie now, I remember seeing snippets of it but have never seen the entire movie. 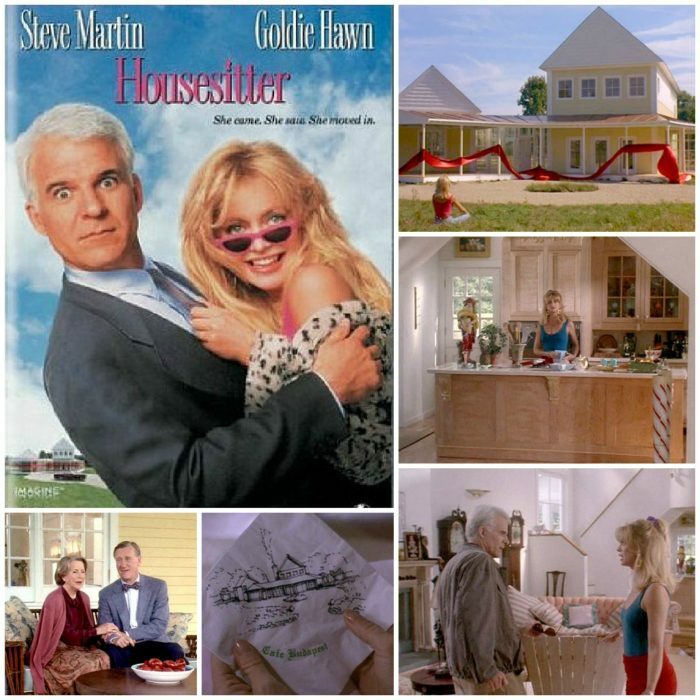 It’s gotta be good if it has Steve Martin, Goldie Hawn and a gorgeous house. LeAnn’s last blog post..I’m up to something ……. FUN! Now I have to see this movie! To Netflix I go!! It looks like a cute house. It seems like a house you’d expect to see out in the Hampton’s, maybe not in yellow. What a fun post! Thanks so much! Have a great week!! melissa’s last blog post..Farm Fun! I love that movie! Thanks so much for posting the pics! I, too, am sad to learn that the house was built specifically for the movie and then torn down. How sad! I always loved those two..throw in a great home and VOILA..excellent entertainment..I loved her parents in the movie..I gotta rent that again..
Lisa’s last blog post..la la lemony…. I totally forgot about this movie. It was so much fun to watch. Always like to watch bold moves made by women! Wish Goldie Hawn would make another great comedy. Also Cohasset in MA is an absolutely beautiful coastal area. I loved this movie and the house. I always thought the window hallway was brilliant. oh my gosh, I watched this movie over the weekend on tv. I’d never seen it before, and I didn’t know the name of it while I was watching…I didn’t see the beginning! I have to admit, I was looking at their clothing fashions more than anything else…that was funny! What a neat house, such a waste to build it just as a set! I need to go watch this movie now. I remember that movie! I loved it! 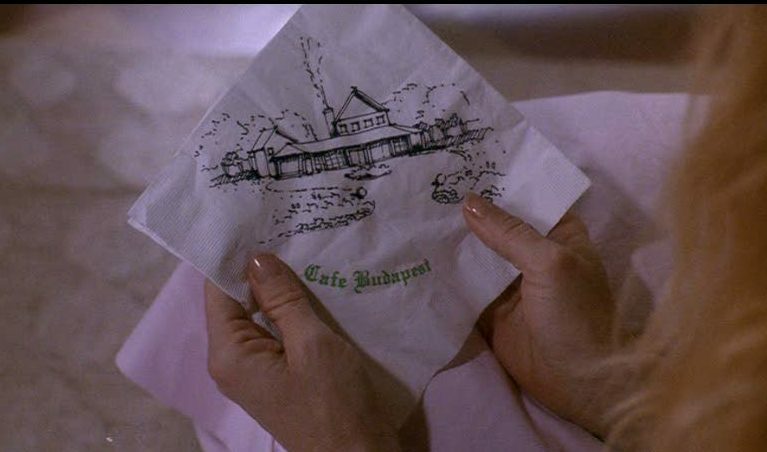 I never realized she was hanging up the napkin pic either. This is one of my favorite movies! I watch it a lot while doing laundry 🙂 I love this house and the little town. I’ve always wondered if that big pond in the middle of town, the one you see at the end when Gwen is getting off the bus, is really situated like that in the city. Does anyone know? Great movie–awesome house! I have watched it over and over and OVER. I love the kitchen and the huge wrap-around porch. Not real hip on the decor but I do love the stacked trunks! This is a good one Julia! Misti England’s last blog post..New Solo Cups ROCK! I always loved this house too, it has such a timeless look. It just occurred to me now that you get to use these Movie Monday posts as an excuse to watch movies for work, why didn’t I think of that? Clever girl! * This TOOO-DELIGHTFUL MOVIE, that I just LOVED & LAUGHED at so much, could be (in “real life”) one of those examples where the woman-of-the-house truly DOES have “her stamp” on EVERYTHING, making it JUST as DARLING as SHE IS!!!!! Then again, I’m a Goldie (n’ Steve, too!) fan from waaaaay back “when”!!! THANKS! This was great fun~~~ i LOVE to SMILE!!! Love Steve and Goldie…can’t believe I have NEVER seen this movie !!! The last movie I saw was Slumdog Millionaire…what a movie..I don’t think I blinked once while watching !!! Would you believe? I’ve never seen this film? Well, that will have to be rectified! Thank you. I can’t believe I’ve never seen this movie! I put it on my Netflix! SueLovesCherries’s last blog post..THIS SUMMER, I WILL ENJOY . . .
Great house! I can’t believe it was built just for the movie then torn down. My husband and I just watched this last Sunday. It had been on our Block Buster mailing list for months and finally it was at the top of the list! My hubby wasn’t really looking forward to watching it but enjoyed it! I loved the little village where the movie was filmed. I remember looking it up after I first saw the movie year ago. Diana@TheDevineHome’s last blog post..My Favorite HGTV Dream House is for S-A-L-E! I haven’t seen this movie in a few years, but I love it! That house really was cute and it amazes me how “now” it is. The stuffed couch and chair not so much, but how many times have we seen the stacked trunks, different colored chairs, the empty birdcage in recent years? A lot! I fell in love-at-first-site (little play on words!) with this house! I have drawn it and reconfigured it a bit, but it is essentially the same Neo-Classical Farmhouse and I WILL build it one day! Thanks for all the interior shots. (And I have to disagree with the writer that hated the stairway… I think it is a beautifully symmetrical focal point. The movie was forgettable, the house was not. I did hate the news that it was torn down after the film. What a waste. PS. Love your blog… I added it to my blog list for future reference! I love this house. I have even written to Trumbull Associates to get the plans altered to make it a 3 bedroom if they can. (Adding two bedrooms in the back of the master and extending a hall into the kitchen. That would make a small courtyard in the middle where I intend to put a water fountian. This house is really beautiful. Simple, elegantly laid out and not pretentious. OMG I remember watching this movie when I was two when it just came out. I watched it not long ago and its so good. I love Goldie Hawn and looking at her in this movie when she’s young I can see how much Kate Hudson looks like her. Those two girls are the greatest female actors I’ve ever seen! 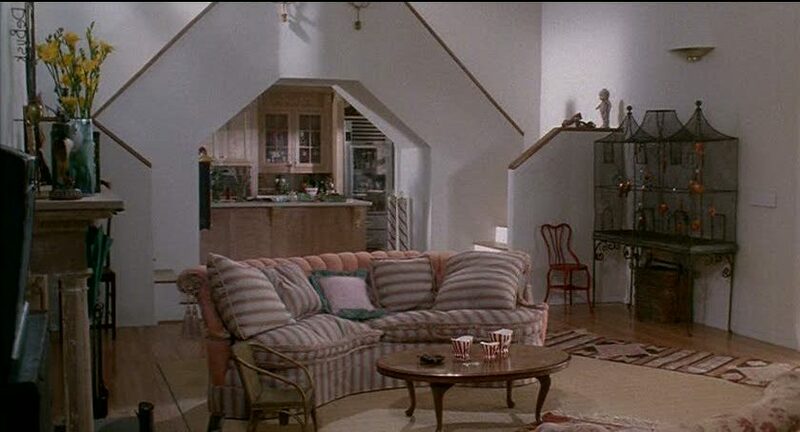 Wow, I have always loved this house from the very first time I saw the movie as a little girl I use to dream of it! I never forgot it but late last night I couldn’t sleep and caught the movie and I fell in love with the house all over again. 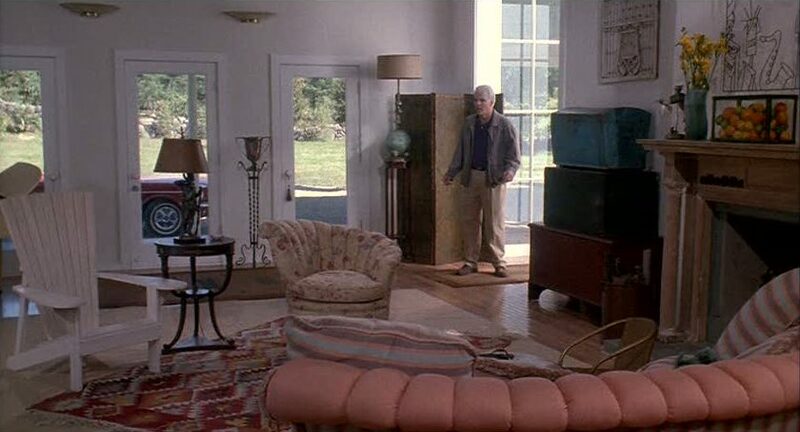 I came to the computer to look it up thinking/hoping maybe by chance another person in cyber space would also have loved the house and even though it was many years ago now that the movie was released posted pictures. Thank goodness for you and this website because I could not find ANYTHING any where else on this house, but your site and you have covered it beautifully! I was so excited as I scrolled down and discovered all the photos both inside and out that you have posted. Thank you so much for taking the time to post this page! Hello – my husband and I have loved this film for many years and after nearly 20 years of dreaming about our future retirement house we just today signed the contract to have this built with just afew tiny changes! I cannot wait to actually be living in this home. .-= Art by Karena´s last blog ..Keep Pushing On =-. I loved both the movie and the house. Thanks for bringing it back to our attention! I remember that movie and loved the house. It was just picture perfect. Thanks for sharing Julia. .-= Becky @ Farmgirl Paints´s last blog ..Laundry love =-. Thank Heavens that Meg Ryan bowed out of this so Goldie could star in it. Well THAT (the building plans being available) explains it! When I first saw this movie last year, I SWORE I saw this house before… I DID! AND, in YELLOW! I can’t remember exactly the road it was on, but it’s in the northern country area above Vacaville (probably a Vacaville address) in California. It was built in the mid-90’s, so that make sense. I remember driving by once in awhile to a friend’s house who lived out in that area, and just loving it. I never saw anyone living in it (it was freshly built), which always made me wonder. I might have to see if I can find it again and see what it looks like now. It was on a beautiful little piece of land (sans the pond) too. Ahhh.. if I could just win the lotto! The architect (check out their website) is incredible. Diana – I live in Sacramento and would be interested to make the drive to see this home built in its original entirety – if you have found the home again or remember its location please reply to this post. Thank you! I love this movie! I actually looked it up just to see the house and plan on building one just like it 🙂 Love the window hallway my fav. this scene is from one of the “Lethal Weapon” films. If anyone would like to get the plans to this house, they are now available from a company called the Drawing Board. Located at 6937 South Bell Street, Suite A. in Amarillo Texas. 79109… Contact Jack Walsh at 806-355-3729… The house was built for Mike Akens in Amarillo Texas. Ask for the ” Akens Yellow House ” Blue Prints. I’ve been in love with this house from the moment I saw it in the movie theatre long ago. I’ve always thought of it as my dream home and was recently describing it to my husband. I’ve emailed him a link to this site and will be adding the movie to the top of my netflix so he can see even more of it. Simply stunning. Thank you! 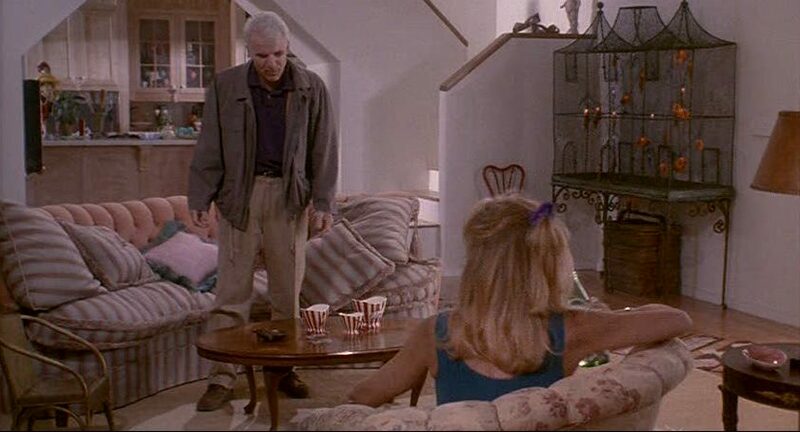 Housesitter is one of my all-time favorite movies! I’ve been a Goldie Hawn fan since high school (when she used to be partnered with Chevy Chase). Anyways, from the moment I saw it, I, too, fell in love with the house and town where the movie was set. 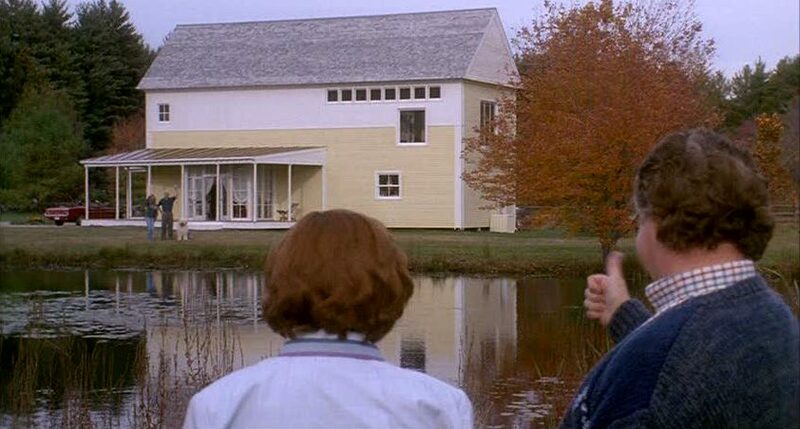 I looked it up on the internet and found out that it was filmed in Cohasset and Concord, MA. 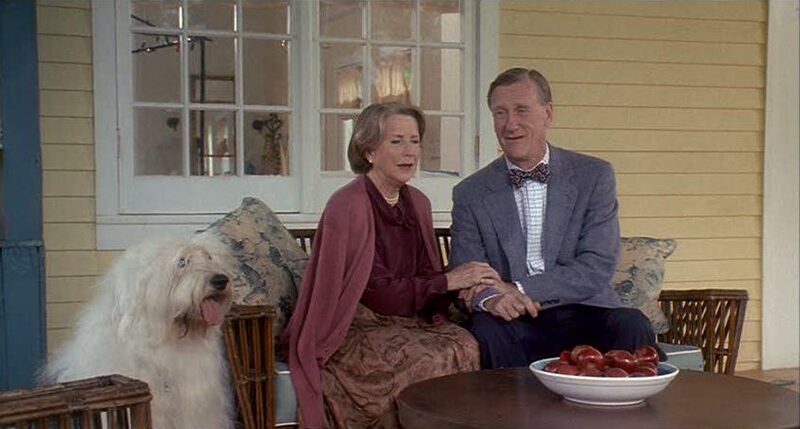 Since then, it has become my dream to live in a house like Davis’ and Gwen’s, in a town like Concord or Cohasset. I’d bet it looks gorgeous during Autumn, which is a season we don’t have in my country (the Philippines). OMG! This has to be one of my most favorite movies ever! The kind of movie I would still watch if I stumble upon it channel surfing at 3 AM. 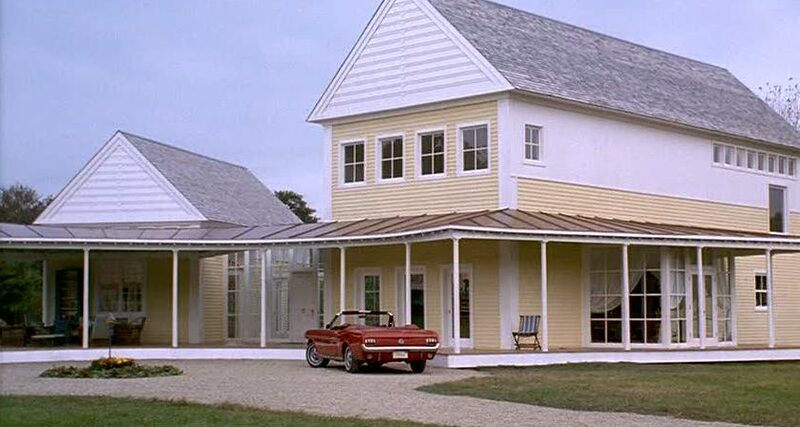 And the best part of the movie for me, other than Steve Martin and Goldie Hawn’s awesomeness was of course the house! I still dream about this house. Too bad it wasn’t real. So pretty!